People say, ‘Weren’t you deprived of your childhood?’ No way. I would not take anything back at all. Everything about it was great. I got to go places, meet people, play baseball against older kids and better competition. I had a great time. Bryce Harper was born in Las Vegas, Nevada. 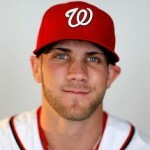 He is an American professional baseball outfielder for the Washington Nationals of Major League Baseball. Harper was selected by the Nationals with the first overall pick in the 2010 Major League Baseball Draft. He stands at 6 feet 3 inches and weighs 225 lbs. Harper won the 2010 Golden Spikes Award, awarded annually to the best amateur baseball player. He made his MLB debut with the Nationals on April 28, 2012. Harper was selected for the 2012 All-Star Game, becoming the youngest position player to ever be selected. He has been touted as a "five-tool player". He has been chosen as the No. 2 corner outfielder in the MLB by professional baseball analytics.